New hair available at Uber. “Binah” here represents Wisdom. This is a Unisex partial rigged hair comprising both top (un-rigged with re-sizable scripts) and bottom (fitted mesh) portion. Poised, a quietness that exudes charm with an edge. A unique hair base included to complete the style with minimalist shaved head design. The hair base includes classic and appliers for TMP, Fiore, Omega (Catwa included). Due to the different UV Map and shape of the mesh heads, there is a difference between the hair base for Fiore, TMP and Omega appliers. The shaved stripes are not available for the TMP heads, only a plain version is included. *The hair base looks best in the Fiore head as shown above. 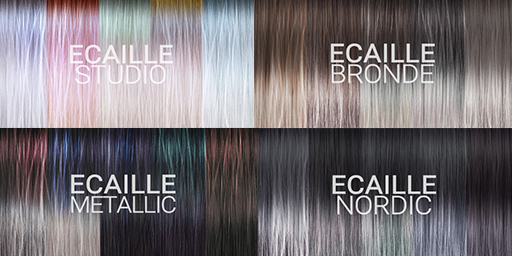 We are also excited to introduce a new collection ECAILLE with 4 sets of colors for the season. To share our excitement with you, we are including all these in the “ALL” version at a promotional price only for this event so be sure to demo them!